Kasturba Medical College, Manipal 576104, India. Abstract: Povidone-iodine is a commonly used antiseptic solution in surgical practice. Almost every patient who needs a minor or a major surgical procedure (sometimes, a medical procedure too) gets exposed to this antiseptic. Even though the use of this antiseptic is widespread, the number of cases reporting hypersensitivity to it is meagre. 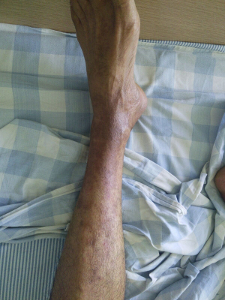 This case report highlights a case of povidone-iodine � induced hypersensitivity, which presented a great difficulty in diagnosis, due to the usage of other drugs that could have been more likely causes for this hypersensitivity. Adverse drug reactions are a serious health concern. They are of 2 types- type A (common) and type B (uncommon). Drug hypersensitivity reactions are grouped under the second class and are dependent on the immune system, unlike type A, which is drug dependent. One sixth of all adverse drug reactions are hypersensitivity reactions. Drug hypersensitivity reactions can have varied manifestations and at times are even fatal.�The most common manifestation of drug hypersensitivity is skin reactions seen in 2-3% of patients who are hospitalized. Antiepileptics and antibiotics are the common class of drugs associated with hypersensitivity. Povidone-iodine (PI) is a low cost, fast and powerful disinfectant, which destroys a diverse variety of fungi, bacteria, viruses and protozoa. It can be used in various ways: soaked or irrigated. It is available commonly as a 10% solution, which can be diluted or used at its full strength. It is a combination of iodine and polyvinylpyrrolidone (PVP, povidone). Povidone acts as a carrier that transports diatomic iodine, which kills bacteria (bactericidal). Povidone-iodine is a rare cause for irritant and allergic dermatitis, the culprit being PVP and not iodine. Irritant effect is seen in about 4% of cases and persists as long as the exposure to the drug is present. Contact dermatitis is relatively less common and is seen on repeated exposures. Anaphylaxis is rare. We present a complex case report of hypersensitivity due to povidine-iodine. 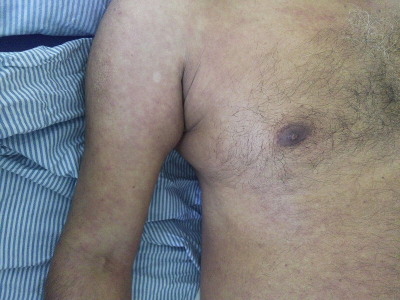 A 60-year-old man presented himself to the hospital with maculo-papular rash all over the body (as seen in figures 1 and 2), accompanied by itching and erythema. On further scrutiny of his complaints, it was revealed that he had undergone a minor procedure (Incision & Drainage of an abscess on his right leg) in a private clinic, 3 months prior to the current consultation. Also, at that time, he had developed similar rashes and itching immediately post-operatively. This was then thought to be due to hypersensitivity to the antibiotic prescribed at the time (Intravenous ceftriaxone). Ceftriaxone was discontinued and instead the patient was started on oral amoxicillin (another beta lactam antibiotic). The rashes decreased in intensity and finally subsided. The patient has been a diabetic and a hypertensive for the past 15 years, well controlled by oral medications. However, he was also started on subcutaneous insulin for better control of his diabetic status when he was admitted for another minor procedure (local wound debridement), a few days later. The treating physician in the private clinic suspected that the hypersensitivity reaction could have been due to the newly initiated insulin (probably due to the zinc present in the preparation used) and hence, insulin was discontinued. So, the patient was discharged with his case sheet saying he is probably hypersensitive to both ceftriaxone and insulin. During the current consultation (3 months following the last hypersensitivity reaction), the patient had similar complaints, but was not on beta lactams or on insulin. But, a more intensive elicitation of history revealed that he had got a local dressing done for his ulcer wound, for which povidone-iodine was used. The only common point among the three hypersensitivity reactions was that the patient was exposed to povidone-iodine in all these situations (the first time, during his incision & drainage surgery; the second, during his wound debridement; the third, during his local wound dressing). The patient did not have any systemic symptoms or signs of hypersensitivity. Vitals were normal, and laboratory investigations did not reveal any abnormality. Also, his blood sugars were well within control. A skin consultation was called for, and the experts labeled him as a patient of �hypersensitivity to povidone-iodine�. Povidone-iodine dressings were stopped, and he was given paraffin dressings instead. Also, clobetasol propionate cream for local application was advised. An antihistaminic drug (levocetirizine) was also prescribed for symptomatic management of the hypersensitivity reaction. Following this, the patient�s rashes subsided, and he improved symptomatically. Based on the Naranjo�s algorithm for causality assessment, this reaction was classified under �Probable�, as it obtained a score of �7�. There are a few things in the above case that are quite intriguing. Is it beta lactam hypersensitivity, insulin hypersensitivity, povidone-iodine hypersensitivity or is there a common compound in all the three, rendering cross sensitivity? One more thing to be considered is multiple drug hypersensitivity syndrome (MDH). Sullivan et al in 1989 described MDH as allergies in between chemically unrelated drugs. Collet et al in 2005 published an article on MDH. According to them, MDH is seen when different drugs are given simultaneously or in a sequence. Patients with severe drug allergy symptoms may have a higher chance to develop a second drug allergy. We were unable to find any data in literature stating there is something common in above mentioned drugs rendering them cross sensitive, thereby making cross sensitivity in this case highly unlikely. Further, MDH is usually seen with antibiotics, hypnotics, antiepileptics, antidepressants, corticosteroids and local anaesthetics. Therefore it is an unlikely explanation in our case. Beta lactam hypersensitivity is of two types: acute (in minutes) and subacute (within 7-10 days). Since the exposure in the above case was 3 months prior to the consultation, beta lactam allergy can be ruled out. Moreover, beta lactam cross-sensitivity is seen more commonly with penicillin and first generation cephalosporin. Ceftriaxone, being a third generation cephalosporin, is not likely to be cross sensitive with penicillin. Insulin hypersensitivity can be type 1 (immediate) or type 3 (delayed relative to type 1). Type 3 hypersensitivity is mostly seen after 6 hours but within 24 hours of injection ruling out insulin as the allergen here. Coming to the present case, in all the instances, dressings were done with povidine-iodine and patient improved when the drug (povidone-iodine) was discontinued and when alternate drugs were used for local dressing. Hence, the diagnosis of povidone iodine induced hypersensitivity is strengthened. To conclude, we would like to suggest testing for povidone-iodine sensitivity before starting any procedure, although the incidence is low. Most often, hypersensitivity to povidone-iodine is not considered unless all other causes are ruled out (as was evidenced in our case as well). This may put the patient under further risk of life-threatening situation or even death, if he/she continues to be exposed to povidone-iodine while eliminating other causes. A careful history elicitation is of utmost importance to avoid overseeing of such rare hypersensitivity reactions in susceptible individuals. Schneider B, Pichler WJ. Mechanisms of Drug-Induced Allergy. Mayo Clin Proc. 2009;84(3):268�72. Pichler WJ. Drug Hypersensitivity Reactions: Classification and Relationship to T-Cell Activation. Drug Hypersensitivity. Basel, Karger, 2007. pp. 168�89. Burks RI. Povidone-Iodine Solution in Wound Treatment. Phys Ther. 1998;78:212-8. Katelaris CH, Smith WB. 'Iodine allergy' label is misleading. Aust Prescr 2009;32:125-8. Wykoff CC, Flynn HW, Han DP. Allergy to Povidone�Iodine and Cephalosporins: The Clinical Dilemma in Ophthalmic Use. American Journal of Ophthalmology. 2011;151(1):4-6. Sullivan TJ, Remedios C, Ong MD, Gilliam LK. Studies of the multiple drug allergy syndrome. J Allergy Clin Immunol. 1989;83:270. Collet CG, Helbling A, Pichler WJ. Multiple Drug Hypersensitivity- proof of multiple drug hypersensitivity by patch and lymphocyte transformation tests. J Invest Allergol Clin Immunol 2005;15(4):293-6. Campagna JD, Bond MC, Schabelman E, Hayes BD. The use of cephalosporins in penicillin-allergic patients: a literature review. J Emerg Med. 2012;42(5):612-20. Heinzerling L, Raile K, Rochlitz H, Zuberbier T, Worm M. Insulin allergy: clinical manifestations and management strategies. Allergy. 2008;63:148�55.